UPDATED: Embattled Fisheries Minister Per Sandberg had to give in to pressure to resign his government post on Monday, and he also resigned as deputy leader of the conservative Progress Party. His resignations follow weeks of criticism that escalated during the weekend, regarding his highly controversial summer holiday trip to Iran and various violations of security policy. Newspapers Dagens Næringsliv (DN), VG and Aftenposten, along with Norwegian Broadcasting (NRK) and TV2 were all reporting Monday morning that Sandberg, a 58-year-old Progress Party veteran, would resign his post during the course of the day. The Office of the Prime Minister later confirmed that an extraordinary Council of State would be held at the Royal Palace at 1pm on Monday to formally approve “changes in the government.” Prime Minister Erna Solberg quickly emerged from the palace with her new fisheries minister, also from the Progress Party, Harald Tom Nesvik. Sandberg’s resignation was all but forced after he’s been widely criticized for exercising poor judgment and a lack of consideration for national security. Those complaints arose after it became known that the newly separated Sandberg had traveled to Iran with his new Iranian-born partner, and that he took his government-issued mobile telephone with him. Not only did his trip and his positive comments about Iran clash with government policy and that of his own conservative Progress Party, he violated government regulations by traveling without reporting his destination in advance and ignoring security procedures by bringing his minister’s phone with him despite warnings it could be hacked by Iranian intelligence. Both Sandberg and Solberg had to answer a series of difficult questions in Parliament on Monday and Sandberg’s answers sealed his fate, after he also had to admit to ignoring security procedures during a trip to China last spring as well. Sandberg’s trip to Iran, along with a series of his own admissions about it, put Solberg and her Conservatives-led government coalition in an extremely difficult position. The political and public uproar over Sandberg, which has dominated the news in Norway for the past few weeks and set off an investigation by police intelligence unit PST, also marks the second time so far this year that a minister from the conservative Progress Party has had to resign a government post because of bad behaviour or lack of judgment. Calls rose this past week that Sandberg was no longer suited to be a government minister, even though he had won earlier praise for his work as fisheries minister. He even had been called upon to take over as acting justice minister after his party colleague Sylvi Listhaug was forced to resign from that government post early last spring. Sandberg couldn’t survive his violations of government policy and regulations, however, especially after he admitted late last week that he had consciously violated policy but wouldn’t say why. The reason emerged during the weekend, and has to do with his separation from his second wife, Line Miriam Sandberg, who’s also a top Progress Party politician and serves as a state secretary in the health ministry. Newspaper Adresseavisen in Trondheim reported that she had alerted the Office of the Prime Minister as early as May that allegedly “foreign powers” had moved in with her ex-husband after he became romantically involved with Bahareh Letnes, the 28-year-old former asylum seeker from Iran who traveled with him back to her homeland. That reportedly prompted Sandberg to also send a complaint to Prime Minister Solberg’s office that his ex-wife had wrongly leaked information from his private calendar, also to people outside the government system. 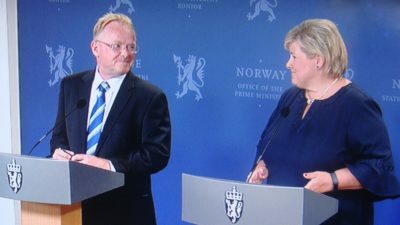 He denied that during the press conference with Solberg on Monday, but it all thrust Solberg and Finance Minister Siv Jensen, leader of the Progress Party, right into the middle of the marital conflict between the two Sandbergs. On Saturday, Per Sandberg’s 34-year-old daughter from his first marriage told TV2 that her father had been forced to change his initial summer holiday plans to travel to Turkey because Line Miriam Sandberg allegedly had leaked them. He and Letnes then decided to travel to Iran instead, with Sandberg opting against informing the prime minister’s office because he feared his ex-wife would leak those plans, too. Both Sandberg and Letnes ended up making their holiday highly public themselves, however, by publishing photos of themselves on social media while still in Iran. Sandberg’s daughter claimed her father decided to take his work phone with him, meanwhile, because all the family trouble meant that he needed to remain accessible. Alstadheim pointed out that Sandberg’s divorce is a private matter, “but his trip to Iran has turned it into a public problem.” In the end, the two Sandbergs became a liability for the government itself, while their divorce has caused problems for the party as well. Speculation was flying on Monday that the controversial Sylvi Listhaug, who stayed uncharacteristically quiet during the recent Sandberg saga, will now succeed him as deputy leader of the Progress Party. She lost her government ministerial position when she accused the Labour Party of putting the interests of terrorists above national security, prompting a majority in Parliament to lose confidence in her. Since that threatened to topple the government, she also resigned under pressure but could return to her seat in Parliament and now, perhaps, join Progress Party leadership.